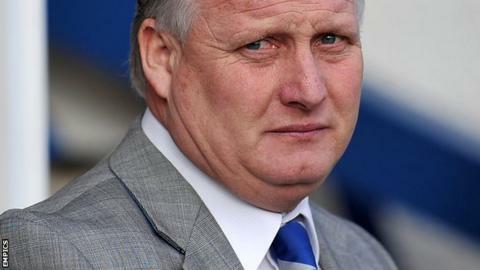 Manager Kevin Blackwell has said he is frustrated to see Bury placed under a transfer embargo for a second time. after the Shakers, currently 22nd in League One, obtained a loan from the Professional Footballers' Association. "Sometimes you take a job on and you think you can have a good go at it," Blackwell told BBC Radio Manchester. Bury were after asking the PFA for financial assistance to solve a short-term cashflow problem. Blackwell was able to strengthen his squad in the weeks afterwards, adding seven new faces, but the latest financial issues have left him unable to add any more players as the club fight to avoid relegation to the fourth tier. "It's frustrating that we're under embargo again," said the 54-year-old, who was appointed in September. "It's just been a catalogue of poor decisions that have been made that have left the club where it is. You're then having to try and solve it all the time. It makes it difficult. "We've got what we've got now - we can't change anything with players. Unless someone comes in and gives us the money and gets us out of the embargo, we can't do anything there."